The Mississippi Flyway closely follows the course of the Mississippi River down through the Delta, although the birds often tend to follow the tributaries rather than the river itself. The longest migration route of any in the Western Hemisphere lies in this flyway. With that high concentration of migrating birds comes a variety you'd be hard-pressed to find anywhere else: Hunters in this part of the Delta routinely shoot mallards, shovelers, pintail, wigeon, gadwall, wood ducks, redheads, ringnecks, scaup, megangers, black ducks, bufflehead, blue- and green-winged teal, coots, Canada geese, snows, specks, Ross' and more. Canvasbacks are seen as well, and hunters have taken them here in prior seasons, but in 2008 it was not legal to shoot them in Mississippi. 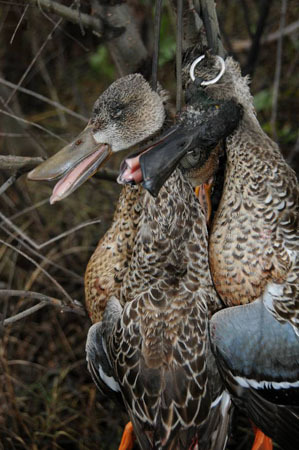 Mallards, teal, gadwall and geese are the most common, but hunters are practically guaranteed a smorgasbord of species. The area also holds higher-than-normal concentrations of specks and has more resident ducks than most Southern states, thanks to the Delta’s abundant reservoirs, refuges, cotton fields and croplands. Hunter's Paradise Lodge offers first-class service and comfortable — but still rustic — accommodations. Gray founded the lodge in 2002 and employs experienced guides that will do all the work — or none of the work, as you prefer — for you, from decoy setting to calling to cleaning. They do have well-trained dogs, but you're welcome (and even encouraged) to bring your own, finished or not. In fact, Gray says "you can finish a dog in a shorter amount of time in an area like this with lots of birds." There are also an abundant amount of wildlife refuges in the Delta — nine within a 50-mile radius of Charleston. Guided hunts are not allowed on the refuges, making this a perfect low-crowd opportunity for do-it-yourselfers. If you plan to go this alone, make sure to brush up on the season dates and local bag limits. The 2010-2011 season opens Nov. 20 for snows, blues, Ross' and white-fronted geese; on Nov. 22 for Canadas and Brant; and on Nov. 26 for ducks, mergansers and coots. There’s also an early two-week September teal season and an early two-week season for Canadas, also in September, both with expanded bag limits. All seasons close Jan. 30, with two youth waterfowl days open on Feb. 5 and 6. Bag limits are a total of six ducks, including no more than four mallards, three woodies, two redheads, two scaup, one black duck or two pintail. Bag limit on mergangers is five, only two of which may be hooded mergansers. Three Canadas, 15 coots, 20 snows, blues or Ross’, two white-fronted geese and two Brant. Possession limit is twice the daily bag limit. The best time to hunt the Delta is December, when duck concentrations are reaching their peak but before the birds have time to get too educated and wise to the ways of hunters. Never forget that the smarter you get, the smarter the birds get — once you show a duck something new, he's learned it, and you've got to find a new way to outsmart him again. 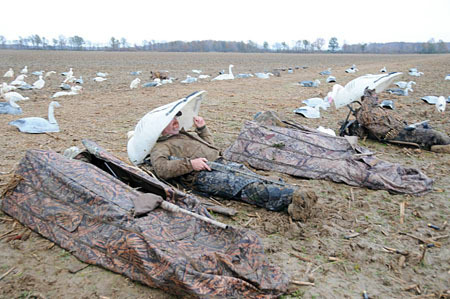 Certain areas of Mississippi also allow a "light goose conservation order," with no bag limits on snows, blues or Ross'. This is a great time to hunt the area. A free permit number is required (call 601-432-2199), but you won't need a federal waterfowl stamp. You do need a valid Mississippi hunting license and state waterfowl stamp, and you must use steel or other approved non-toxic shot shells. Electronic calls are legal, as are unplugged shotguns — this is a shooter’s paradise. The 2010-2011 season is open Oct. 1-Nov. 19, Jan. 31-Feb. 4, and Feb. 7-March 31. The Delta is dominated by rice, corn, bean and cotton fields, and small ponds and rivers. Good camo is absolutely essential in this relatively open terrain. A waterfowling pattern such as Advantage Wetlands, Mossy Oak Duck Blind or Avery's Killer Weed will serve you well, although just about any pattern will do as long as you conceal yourself with native vegetation or the ever-present mud. You’ll need a Mississippi license (Click here) and a state waterfowl stamp, as well as a federal duck stamp, of course. Layout blinds are the logical choice for hunting agricultural fields, but you can enjoy just as much success hiding in and around native vegetation on river banks or ponds. Because of the great variety of species you'll encounter on the Mississippi Flyway, you'll need several different calls and decoys, and you'll need to know how — and when — to call properly. Knowing when not to call is equally important. If you chose to employ the services of a guide, he or she will likely shoulder some of the calling responsibilities and can teach you a thing or two about calling to different species. If you're used to hunting one or two species in your neck of the woods, consider a trip to the Mississippi Delta to take advantage of the best the Flyway has to offer. As long as your shooting skills are up to snuff, you're guaranteed to go home with a mixed bag full of different ducks and geese to throw on the grill.